Affordable Sports Programs! 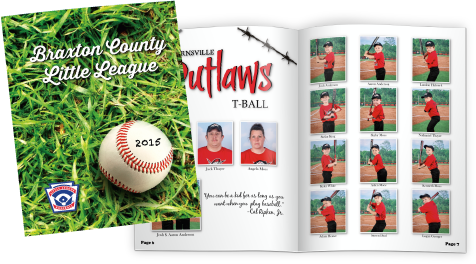 Sports Program Printing Is Essential for Any Sporting Event. Football - Baseball - Basketball - Soccer - Tennis - Wrestling - Swimming - Volleyball - Cheerleading - Track & Field - Hockey - Marching Band - Lacrosse - Softball - Roller Derby - Horse Shows - Rodeos - Car Shows - Racing & more! These quality 8.5 x 11 and 5.5 x 8.5 saddle-stitched programs are printed with 8-96 pages in full color (4/4) with vibrant photos on top quality premium 100# gloss or matte text (Self Cover) or add 80# gloss or matte cover paper (Plus Cover), which can be UV coated to give that luxurious high gloss finish. They are very durable and will make a positive and long lasting impression. The key to creating successful sports program printing is to think like a fan - what would they want to know? It's easy to fill with information that an organizer wants attendees to know, but this may not always be relevant to fans. When sports fans attend a game, they often don't want just to watch it - they want to become involved. The best way to do this is through printed sports programs, which enable attendees to learn about players, schedules, and other information about their teams. If you don't have the sponsor base that larger cities do, perhaps one program for all of the sporting events. For example, fall would include football, soccer wrestling, volleyball, band, or other fall sports, winter would include boys' and girls' basketball and cheerleading, spring would include baseball, softball and lacrosse, or you could combine them however you see fit for your community and sponsor base. For multisport programs, you could print half of the program upside down giving you 2 front covers. Get your spring sporting and event programs and posters designed and printed now. It's not too late to make your school yearbooks and memory books. It's not too early to start planning your fall sporting and event programs, posters and school year fundraising calendars. I had one picture that spanned across two pages that I lost part of the middle of the picture. The proof looked like it was going to be fine, but I guess I needed to split the picture and add with the bleed lines better. Some of the color matching was a bit off, it might be useful to have color swatches/profiles for users. And some of the templates were problematic to download (missing file or permissions.) Minor compared to a FANTASTIC product, very pleased and will use again.